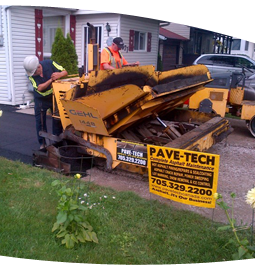 Whether you currently have a gravel driveway, laneway, or parking lot or whether you are in need of your current damaged asphalt to be removed and replaced, Pave-Tech is ready for the job! Once you receive your Estimate, and you are ready to proceed, what happens next? A solid driveway that lasts is only as good as what's underneath it. Pave-Tech will look after securing all applicable utility demarkations on your behalf. Once all underground utilities lines have been marked, and we are given approval to proceed by the various utility companies, we will begin the excavation process. All unusable material will be excavated and properly-disposed of off-site. Excavation depths will vary depending on what we find under the surface (ie. tree stumps, tree roots, rocks, etc. ), but at minimum, you can expect the area to be excavated to a minimum depth of 6 inches. Although this is Step #2, it is the most important step in the entire paving process! Proper Base Preparation is essential in ensuring you get the most life out of your investment in a new asphalt surface. Our skilled Crew will ensure that you receive the best-quality base materials (crushed Gravel and/or Concrete), and that the area is fully-graded and compacted with a vibratory roller for the best pitch and durability before the new asphalt is installed. 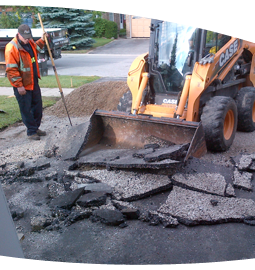 Your newly-prepared base should be left for at least 5 - 7 days before installing new asphalt. Why? Because this allows for natural earth settling, and allows us to address any sinkage issues BEFORE the asphalt is installed. You are encoured to drive and walk on the base surface as much as possible, as this will help the settling process. Once the base is fully-prepared and has had ample time to settle, our Crew will come in to install the new hot-mix asphalt. We use only the best Hot-Mix Asphalt available in the local area, and installation takes place using commercial-grade equipment that ensures the best possible final product. Another imperative step in the process in the Finish Compaction of your newly-installed Asphalt surface. Using a vibratory drum roller, in conjuction with a finish roller, the entire surface will be compacted to a smooth, strong finish. All edges are hand-tamped to ensure that they can withstand vehicle weight.